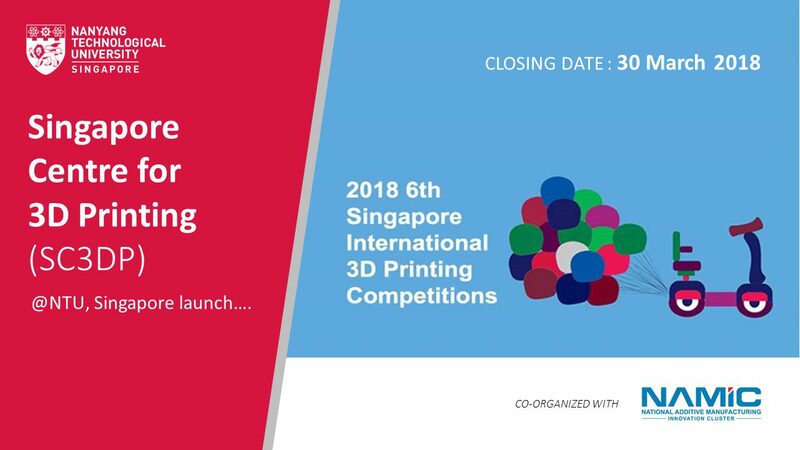 Organised by the Singapore Centre for 3D Printing (SC3DP) at Nanyang Technological University, Singapore, the Singapore ?International 3D Printing Competitions goes into its 6th successful run in 2018! Launched in 2013 with an overarching mission to promote awareness and adoption of 3D printing technologies, the competitions are open to the general public (open category) with a top prize of $10,000, as well as tertiary and school students (student categories) with top prizes of $5000 each. ? In line with Singapore’s transition to car-lite transportation, the themes for the 2018 Competitions will be 1) Make Singapore car-lite by designing personal mobility vehicles and 2) Mobility devices – a transport solution for the elderly.